"Just out that Obama Administration granted citizenship, during the terrible Iran Deal negotiation, to 2,500 Iranians - including to government officials," Trump tweeted. "How big (and bad) is that?" Jeff Prescott, the former senior director on Obama's National Security Council, called Trump's allegation "absurd and entirely false." "There was no connection between the Iran nuclear deal and immigration policy," Prescott added. The unsubstantiated claim first gained attention with a Monday story on Fox News' website that relied on the word of an Iranian cleric who is also a member of the country's parliament. The article itself quoted, toward the end of the story, the network's own commentator, former Obama State Department spokeswoman Marie Harf, saying, "This sounds like totally made up BS." The story said the Department of Homeland Security and State Department declined to comment, and that a representative for former Secretary of Homeland Security Jeh Johnson could not be reached. On Tuesday morning, just hours before Trump's tweet, the story made its way to Fox News' airwaves on "Fox & Friends First," the network's early morning show. It also later aired on "America's Newsroom," a late-morning news program on Fox News. "It shouldn't be lost on anyone that this is a case of Donald Trump parroting Fox News, which is peddling the claims of an Iranian hardliner," Prescott told CNN. 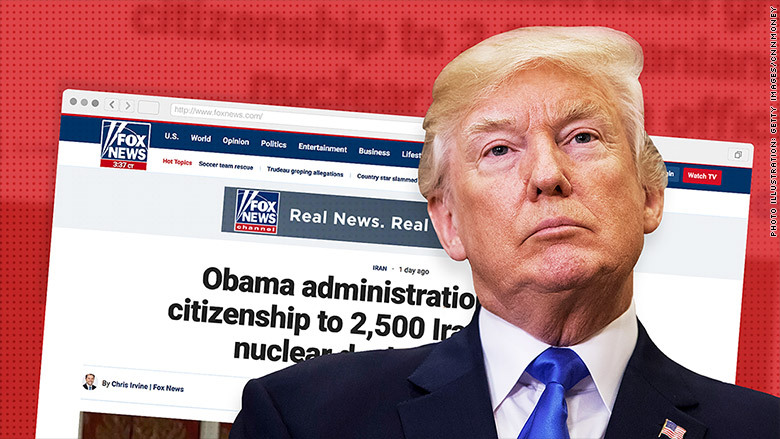 Jake Sullivan, a former Obama official who was involved at the start of the Iran nuclear negotiations, also skewered Trump for relying on Fox News' thin report to make what he called a "completely false" claim. "What is interesting about this is that what happened is a hardline crank in Iran just randomly made this comment, Fox News writes a story on it, and then Trump tweets it," Sullivan said on "The Situation Room." "He had every opportunity to call people in his own Department of Homeland Security and State Department to ask whether or not this was true. And they would have told him it wasn't," Sullivan added. "Instead, he relies on Fox News. And the scary thing is that he's increasingly relying on sources like Fox News to get his intelligence rather than the professionals in his own government." Neither a spokesperson for Fox News nor the White House responded to a request for comment Tuesday afternoon. This would not be the first time Trump has tweeted false or questionable claims that have originated in right-wing media. The President has a long history of stoking conspiracy theories that target his political rivals. -- CNN's Jamie Crawford contributed reporting.